If you are living in area where problems like tornadoes, earthquakes, snowstorms and hurricanes are common then you should keep aside emergency food and fluid supplies to survive during emergency. First-aid kits are one of the must-haves for your home as they are extremely useful in handling minor injuries on your own. An ideal first-aid kit must contain scissors, cold compress, gauze, tweezers, bandages, antiseptic etc. Power failure is the most common problem faced by people at the time of emergency in their home. So always keep any alternative source of power in your home which will be portable, compact and provide you sufficient light. Always keep the copies of important documents such as insurance policies, social security cards, driving license and birth certificates in waterproof container. Remember to add extra car keys and home keys in this container as well. CCTV cameras are one of the modern home safety equipments which will help you to protect your home from incidents such as theft, burglaries, accidents etc. 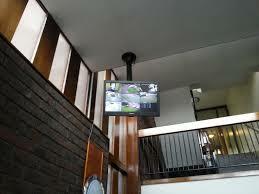 These devices also come with video recording facility which lets you to record the happenings around your home in your absence. They are extremely effective when you are planning to leave your home for long vacation. A proper plan coupled with some emergency must haves will help you to face any catastrophic situation. The home safety items mentioned above will definitely help you to deal with any emergency in most effective way.